A storytime on children’s names can be a great way for the storyteller to learn everyone’s names. For an activity, make nametags: www.seussville.com/activities/Seuss_BTSEduKit_Badges_WEB.pdf . Include lots of songs that describe names, including “B-I-N-G-O,” “Mary Wore Her Red Dress,” “John Jacob Jingleheimer Schmidt,” and others. Alexie, Sherman. 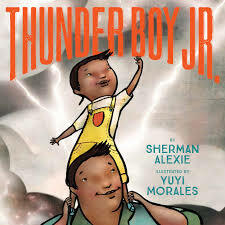 Thunder Boy Jr. Little Thunder would like a name of his own, so his father Big Thunder helps him find the perfect name. Deal, Laura. How Nivi Got Her Name. A young Inuit girl asks her mixed-race family how she got her name. Dunklee, Annika. My Name Is Elizabeth! Elizabeth likes her name and doesn’t appreciate nicknames. Henkes, Kevin. Chrysanthemum. Chrysanthemum always liked her name until some kids start to make fun of it. Lester, Helen. A Porcupine Named Fluffy. Fluffy does not feel his name is suitable for a porcupine. Peek, Merle. Mary Wore Her Red Dress. Colors and names are the focus of this popular traditional song. Use the names and clothing of audience members as examples. Seeger, Laura Vaccaro. Dog and Bear: Dog Changes His Name. Dog wants a new name so Bear tries to make suggestions. Slate, Joseph. Miss Bindergarten Gets Ready for Kindergarten. The children in this class have names from a to z, incorporating both the alphabet and a fun school story. Waber, Bernard. A Lion Named Shirley Williamson. A lion’s unusual name causes confusion at the zoo.